When many of us think of mushrooms, we may think of culinary delights such as Portobello and Shiitake, or we may think of those "magic mushrooms." But the implication of mushrooms is absolutely profound. They have the potential to dramatically improve our health and the health of the planet, according to mycologist Paul Stamets. I was fortunate to meet up with Paul last week after he delivered his powerful talk at the TEDMED conference in San Diego, California. Paul was an audience favorite at TEDTalks 2008, and he has quickly become a TEDMED sensation. PF: Hello, Paul. Thanks so much for meeting with me today. You have been a mycologist for over thirty years. Can you explain what that entails? PS: A mycologist is a biologist who specializes in the study of fungi. There are 2-4 million estimated species of fungi in the 'kingdom,' and about 150,000 are thought to be mushroom-forming fungi, yet we have only identified around 14,000 species thus far. Mycologists are few and far between. We are under-funded, poorly represented in the context of other sciences -- ironic as the very foundation of our ecosystems are directly dependent upon fungi, which ultimately create the foundation of soils. PF: Well, your talk today certainly stirred interest in this important yet overlooked field. Earlier, we were discussing some of the amazing medical breakthroughs we've witnessed here at the TEDMED conference. Yet the audience was just as blown away with your low-tech, ecologically-friendly solutions to health restoration as they were with many of the higher-tech solutions. PS: As stated at TEDMED, the FDA is so adverse to the approval of new drugs (and scandal!) that the estimates are now that a new drug costs more than a billion dollars to get to market. Drugs are isolated constituents -- single molecules -- studied for their activity. Mushrooms are constellations of hundreds of thousands of constituents. 1) supporting and strengthening your immune system? 4) restricting blood vessel growth feeding tumors ("anti-angiogenesis")? 5) causing programmed cell death of cancer cells ("apoptosis")? 7) restricting the growth of pathogenic bacteria? 8) assisting conventional anti-cancer drugs to work more effectively at lower doses? Mushrooms provide all these benefits, and they are not drugs. These are 'functional foods' and/or 'dietary ingredients,' which help support the immune system on a fundamental, multi-factorial level. Nature is a numbers game. We need all the support we can get as our immune systems and health are under assault from pollution, stress, contaminated food and age-related diseases as our lifespans increase. PF: Next time I'm enjoying some delicious sautéed shiitake mushrooms, I know I'll be extra grateful as I'm now more aware of their wide variety of health benefits! Paul, as I'm sure you know, botanicals such as echinacea and ginseng are somewhat in the mainstream; however, the implications of medicinal mushrooms seem to be so promising yet not as well known. Can you give us some examples of medicinal mushrooms and their healing properties? PS: Mushrooms are miniature pharmaceutical factories, and of the thousands of mushroom species in nature, our ancestors and modern scientists have identified several dozen that have a unique combination of talents that improve our health. Culinary mushrooms available in many grocery stores such as Shiitake, Maitake, Oyster, Enoki, Shimeji, and Pioppinos -- to name a few -- are not only delicious but are very low in fat, have no cholesterol, are rich in vitamins, and when exposed to sunlight, are one of the best sources of vitamin D (provitamin D2) on the planet. Moreover, the mycelium -- the filamentous cobweb-like cells that give rise to the mushrooms (the mushrooms are the 'fruit' of the mycelium) -- have uniquely amplified properties, especially against viruses and bacteria. My team and I have discovered, over decades of study, that mushroom mycelium is a rich resource of new antimicrobial compounds, which work in concert, helping protecting the mushrooms -- and us -- from microbial pathogens. PF: During your TEDMED talk, you referred to an NIH (National Institutes of Health)-funded study regarding mushrooms and breast cancer. That sounded very promising. Can you provide the details on that study and its implications? PS: NIH funded a $ 2.1 million dollar breast cancer study that was recently completed. 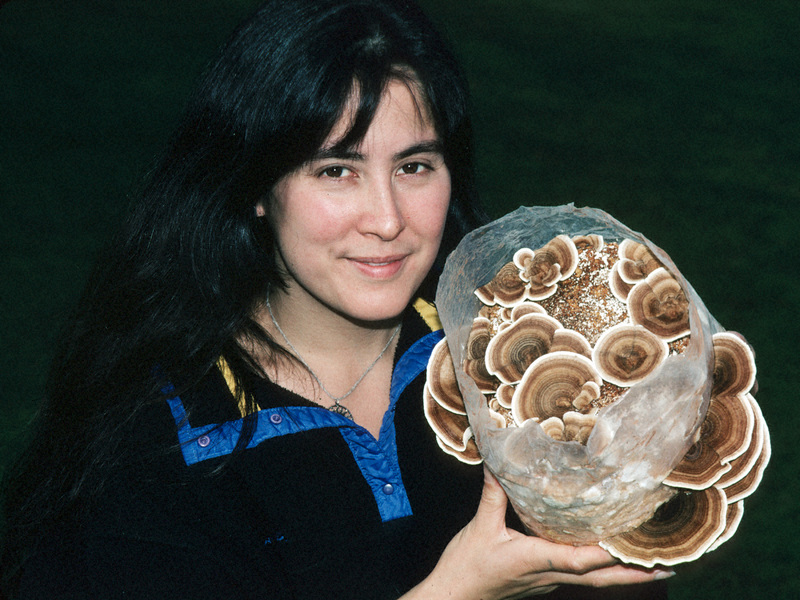 The study used the mycelium from Turkey Tail mushrooms (Trametes versicolor). The study group was for non-ER (non-estrogen responsive) breast cancer patients who took Turkey Tail capsules in combination with conventional therapies, particularly radiotherapy (radiation). After radiation therapy, and often in response to chemo-drugs, the native immune population of NK (natural killer) cells plummets. On a dose dependent basis, the study showed that the population of NK cells increased compared at 3 and 6 grams per day (6-12) capsules, compared to none. Modern medicine has great drugs, but nothing for helping the immune system as mushrooms do. PF: The connection to this study and the treatment for your mother simply stunned the audience. You shared during your talk how your mother was diagnosed with stage-four breast cancer over two and a half years ago, and given three months to live. Thanks to the combination of taxol, herceptin, and turkey tail mushrooms, you declared that today she has no detectable tumors. 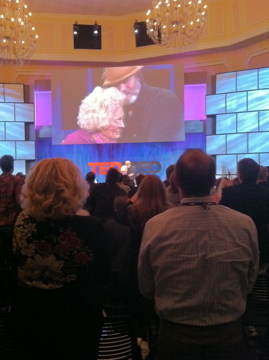 How wonderful that she was able to join you on stage at TEDMED today and inspire a standing ovation. This conference has certainly generated a lot of mental inspiration, but when your mom came on stage, I saw many hearts absolutely melt. How did it feel to be able to let your life's work be part of health restoration for your own mother? PS: Our parents gave us life. There is no greater honor and duty than for a child to help their mother and father. I tried to help my father -- he too had cancer -- and although the doctors approved the use of our mushrooms, my stepmother blocked treatment. This was psychologically crushing to me. With my mom, I had a second chance, and she trusted me. My mom is a deeply spiritual and kind soul. She feels it was my destiny to help her. I don't disagree. I hope others benefit in the same way my mom has benefited. Now my mom is taking 4 Turkey Tail and 4 MyCommunity (a 17 species blend) per day. The multispecies blend seems to activate more of an immune response and benefit than from a single species, but clinical studies on this have not yet been conducted, although in vitro studies do support this hypothesis. PF: Mushrooms have such potential with assisting in restoration of health. Why don't we hear more about them? With the current health care crisis, it seems like almost anyone could benefit from at least adding mushrooms to their diet. PS: Mushrooms are very different from plants. Mushrooms inspire curiosity but are so short-lived -- they disappear in a few days whereas plants are viewable in the landscape for many months, if not years. Naturally, something that is so powerful, yet so temporarily encountered, is likely to be poorly understood. And since some mushrooms can feed you, kill you, propel you into a profound spiritual experience, human knowledge of mushrooms lags behind the knowledge of plants. Risk is not without its rewards, and now through thousands of years of use, we know now many mushrooms which are safe to consume and are powerful reservoirs of beneficial agents. Hippocrates, the father of modern medicine, first mentioned the Amadou mushroom in 450 BC; Dioscorides, in 65 AD, first describes the Agarikon mushroom, one which we are exploring for its anti-flu and anti-herpes activities, as well as it long-viewed reputation as a treatment against 'consumption' later to be known as tuberculosis. In Asia, Reishi and Turkey Tail also have been recorded for thousands of years for their 'system-improving' benefits. In essence, we are rediscovering what our ancestors long ago knew: mushrooms are rich reservoirs of power medicines. PF: Thanks so much for meeting with me today. We'll look forward to reading more of your mushroom wisdom as you share the gems on The Huffington Post. Before we part, I have to ask you about your hat. You mentioned in your talk that it is entirely made of mushrooms. What kind of mushrooms? Where did you find something so uniquely, well, uniquely you? Paul Stamets with his "Mushroom Hat"
PS: My hat is made from Amadou, a birch polypore mushroom. They are hard, hoof-like conks. This mushroom is a fire-starter mushroom and allowed our ancestors to carry fire from one location to another. When this mushroom is boiled in lye-water, the fibers separate back into mycelium. The loosened cellular fibers then can be matted. Thanks to some ladies in Transylvania, this age-old tradition has been kept alive -- and I got this cool hat -- yet another example of our deep respect for and use of these life-saving mushrooms. PF: The "buzz" around your talk today certainly was one of hope. It is very empowering to know that something so readily available with a such a history of safe use and effectiveness backed by numerous studies can provide such support to challenged immune systems. Nature is a numbers game. We are composed of many organisms to create a complex system that is in balance. So too, are our habitats. As our internal and external ecologies become imbalanced, disease can appear. I believe that habitats and humans share immune systems and mushrooms are cellular bridges between the two. What is so wonderful about the use of mushrooms is that they help tip the balance in favor of maintaining and supporting the immune system. For anyone wanting these mushrooms, please make sure that you know who grew them, that they are certified organic, and that they have been used in Western clinical studies (which typically have more stringent parameters). 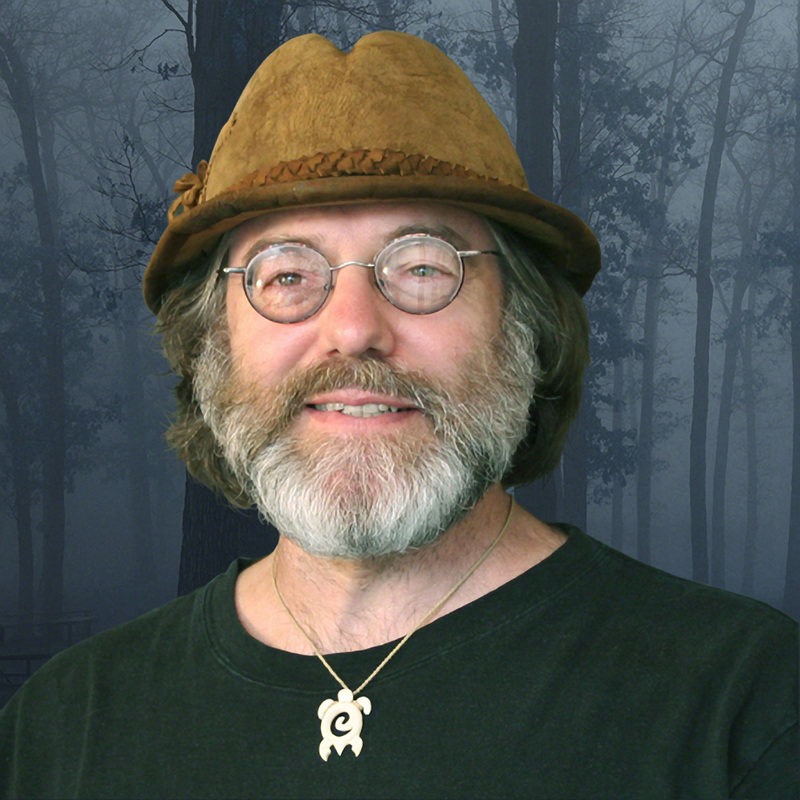 For more research on the health benefits of mushrooms, information on mushroom cultivation, sources of organic mushrooms, educational opportunities, and more on the work of Paul Stamets, please visit www.fungi.com.